1. This versatile bench lets you perform a range of exercises to target specific muscle groups in a compact space. Engage in fat-burning, muscle-building workouts right in the comfort of your own home. 2. Created to suit your active lifestyle, this workout gear is the perfect addition to your home gym. Esides, the powder coated finish for resistance of heavy wear and tear and can support a maximum weight of 300 pounds. 3. This bench has a durable steel construction made of premium materials. Its heavy-duty steel tube frame is furnished with high-density foam, ensuring steady support maximizing your comfort while you exercise. 4. Perfect for amateur trainers and long-time fitness enthusiasts, the Ollieroo Flat Utility Weight Bench allows you to perform a full-body workout so you can build and tone your physique however you want. Wheels for Mobility -- The Ollieroo utility bench has a convenient handle & Wheels, it is effortless to move this bench to where you need. Heavy-Duty Construction -- This bench is made from high quality steel and completed with a powder coated finish to increase the bench's longevity. 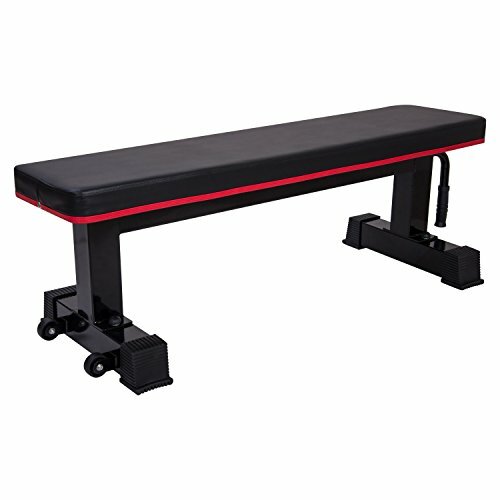 Multi-purpose Bench -- Great for use in squat rack, cage or weights for a wide variety of workouts - body toning, muscle building, strengthening and much more. Easy Assemble -- Designed for easy installation,with the included assembly manual & all mounting hardware, this flat bench is as easy to assemble as it is to store. Notice: For the low temperature of cold winter, the rubber feet should be heat to soft before you install. Thick High-density Foam -- The high-density foam padding with a 2.5'' seat pad for comfortable use, max weight capacity is 1320 lbs, with 2-year limited Manufacturer Warranty.